The Christmas lights in Malaga are world famous. This year, you can see them being switched on on the 24th November. 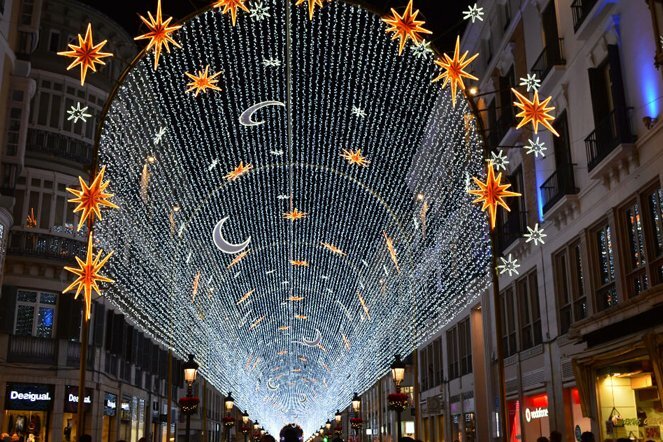 The most spectacular street is Larios street – in the centre of the city - which in past years has exhibited over 600,000 lights!! The theme and design this year, has been inspired by Malaga Cathedral. The new lighting design will also be expanded into more streets. In Plaza de Las Flores, there will be balloons distributed to the children. Iluminaciones Ximénez are responsible for the lighting. They are also famous for lighting several famous companies, and streets such as 5th Avenue in New York, Las Vegas, Dubai, and Hong Kong to name just a few. Although the lights are a large attraction, Malaga is a great place to visit at Christmas for many reasons. There will also be several light and sound shows every day at 6:30 pm and 9:30 pm, where traditional Christmas songs will be played. The new streets added to illumination display are: Calle Marqués, Sagasta, Souvirón, Plaza de Camas, Calle Herrera del Rey, Puerta del Mar, Calle Moreno Carbonero, Calle Álamos and Calle Granada. The 6 giant Christmas trees are between 6 and 18 meters One of them in Huelin Park, two almond trees of 8 meters, one in the square of the Cervantes Theatre and another in Alcazabilla street. A huge Christmas tree with a metallic structure in the Plaza de la Marina, also another one of 18 meters in the Plaza de la Constitución, illuminated following the lighting style of Larios Street, a Christmas tree in the Plaza Enrique García Square and finally one in Molina Lario Street. All of them illuminated with LEDs and beautifully decorated in festive style. Christmas markets are becoming more and more popular each year. They are a great opportunity to stroll around with the family, and purchase interesting gifts you might not find anywhere else. Malaga – Soho District & Alameda Park - 11am - 8pm - The Soho area of Malaga hosts a Christmas market with arts, crafts and antiques among many other items. This charity market will open in January on Monday 2nd, Tuesday 3rd, Wednesday 4th and Thursday 5th. For donating the opening time is from 10am to 2pm and from 5pm to 8:30pm. Torremolinos Christmas Market - (near train station) from Friday 2nd of November. Fuengirola Christmas Market - Plaza de la Constitución. There are many hotels and restaurants that offer New Years´s eve packages. These can be quite expensive. If you simply want to celebrate and catch the atmosphere of your town, the following places are traditionally very busy, and you will find great places to eat and drink – best to book beforehand. Three kings is a popular procession, where the ´Kings´ travel through each city and village, giving sweets to the waiting children. In Malaga, the three kings parade will leave from the city hall on Monday 5 January.